CARSON, Calif. (AP) — Oakland and the Los Angeles Chargers both come into Sunday’s game ranked in the Top 10 in total offense. The matchup between AFC West rivals is likely to come down to who has the greatest success running the ball. Both teams had a 100-yard rusher in their wins last week. 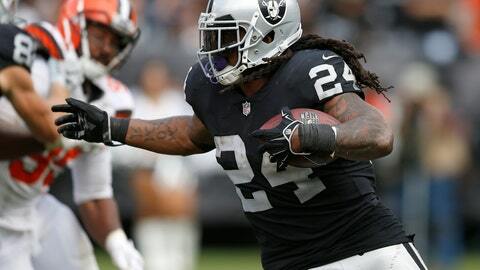 The Raiders‘ Marshawn Lynch had 130 yards in a 45-42 overtime victory over Cleveland , while the Chargers’ Melvin Gordon gained 104 yards on the ground in a 29-27 win over San Francisco . Lynch and Gordon are both ranked in the Top 10 in rushing. Lynch is fourth with 300 yards and has shown flashes of being back to the level he displayed in Seattle from 2011-14, when he had four straight 1,000-yard seasons. Gordon is seventh with 276 yards. Both players are showing they are physical runners in different ways. Lynch has generated 77.3 percent of his yards after contact according to SportRadar, the highest percentage among the top 24 backs. Gordon is tied for third in broken tackles with 12. Gordon is also making an impact in the passing game as he is tied for the Chargers’ lead in receptions with 17. That has allowed him to lead the AFC in yards from scrimmage with 475. Both teams are looking for a win to avoid falling to 0-2 in division games. Quarterback Philip Rivers said the Chargers need to start stringing together wins to avoid falling further behind unbeaten Kansas City. Oakland’s Derek Carr and Rivers have split their first eight meetings. Both are coming into the game with momentum. Carr is looking for his third straight 300-yard game, which would be the first time that has happened in his five-year career. Rivers has thrown 11 touchdowns, tying for the most he has thrown in the first four games. The Chargers are hoping defensive tackle Corey Liuget’s return from a four-game suspension for violating the league’s policy on performance enhancers helps improve a pass rush that has struggled. Los Angeles has only eight sacks as Melvin Ingram has been frequently been double-teamed. Defensive end Joey Bosa will miss his fifth straight game due to a foot injury. The Raiders will have an untested tackle this week after right tackle Donald Penn was placed on IR with a groin injury. Rookie Brandon Parker will step in and team with fellow rookie Kolton Miller, who is on the left side protecting Carr. According to the Elias Sports Bureau, this will be the first time since the 1970 merger that the Raiders will have two rookie tackles starting in a game. The Raiders hope the anticipated debut of cornerback Daryl Worley will help eliminate the big plays that have plagued the defense. Oakland has allowed a league-worst five 50-yard or longer plays and is tied for second worst with 23 plays allowed of at least 20 yards. Worley should provide a needed boost in the secondary as he returns from a four-game suspension for violating the league’s policies on substance abuse and personal conduct. The Raiders left Los Angeles in 1994, but they still have a large and boisterous contingent of fans in the area. When the Raiders played a preseason game against the Rams at the Los Angeles Memorial Coliseum on Aug. 21, it sounded like a Raiders home game. Even though the StubHub Center seats only 27,000, it is likely the crowd will be predominantly silver and black. The Chargers have won five of their past six at StubHub, but it hasn’t felt like a home-field advantage. Last Sunday’s game against the 49ers appeared to have more San Francisco fans.